Is it too late to wish you a happy new year? Because this is the first post of the 2016. Urgh! We’ve had flu and bugs galore, we’ve had a death in the family….all a little too all-consuming to allow for luxuries like blogging. Anyway, before I give you some easy, eminently doable Lent ideas for families like mine (and maybe yours too?!? ), a little housekeeping. I love blogging here and, despite going back to work part-time, life is just as full of fun traditions, zany activities and oodles of creativity around here. There’s so much I’d love to tell you. I’m loving seeing my kids start to expect the rhythms, traditions and activities of the Church year and the seasons and to join in and really own them. I’m excited about how I’m growing spiritually myself through the challenges of mothering two slightly older children, both now at school and I’m always discovering resources I’d love to share with you. Three years ago, we started the Jesse Tree tradition in our family for Advent. 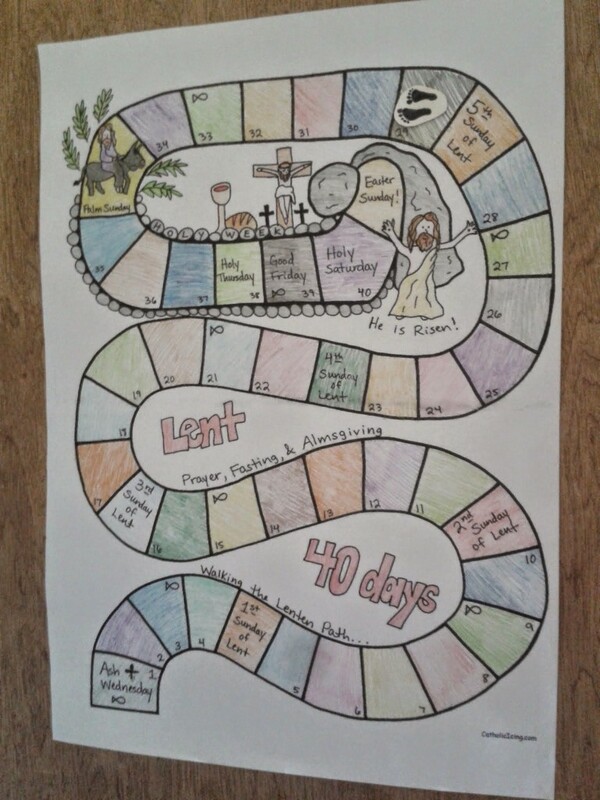 Bouyed up by the success of our daily bible reading which the children enjoyed so much and the visual resource it created, I tried something similar for Lent in Spring 2014. It bombed. Here’s the main issue. Lent is twice as long. 24 days to focus on something feels doable. 47 days is a whole other ballgame. Maybe when they’re older some such thing will work but for now, here’s our approach for my now 4 and 6 year old. Maybe some of these ideas would work for your kids? By the way, if you want to have a think about why we might celebrate Lent, you might find this post useful or you could catch some inspiration from my Lent Pinterest board. We use the calendar printed above so the kids can see Easter approaching. It’s so simple but they love it so much that my little boy is waking up saying “3 sleeps till Lent, Mummy!” I printed t A4 at home then had Staples blow it up to A1 for me. 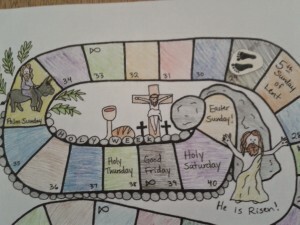 Here’s the link to this lovely free resource (and she has lots of other treasures on her site): http://www.catholicicing.com/printable-lenten-calendar-for-kids/ It’s available in colour or you can colour it yourself like I did. 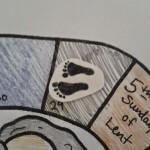 I drew two little footprints and we move them along each day with blu-tak. We also have a daily prayer project. Last year we just chose 47 people to pray for and had their names on slips of paper in a basket on the kitchen table. It was amazing what answers to prayer we had, even though we chose each name at random each day. This year my daughter and I will cut out flowers and leaves (she’s decided flowers for girls and leaves for boys as we are firmly in the fluffy pink unicorn stage!) and will put the names on them, adding them each day to our currently bare Jesse tree/Thanksgiving tree which now seems to be a permanent part of our decorating. If you’ve read this blog for any amount of time, you’ll know I’ve been heavily influenced by Michelle Guiness and, especially, The Heavenly Party, wheres she writes about celebrating the different parts of the church year at home as a family. The only frustration I had with this book when my kids were small was that she really started exploring these festivals and their links to the Jewish roots of the Christian faith when her children were a little older so I’ve adapted many of her ideas for tinies over the years such as Shabbat on Friday evenings and our family-friendly Passover meal. 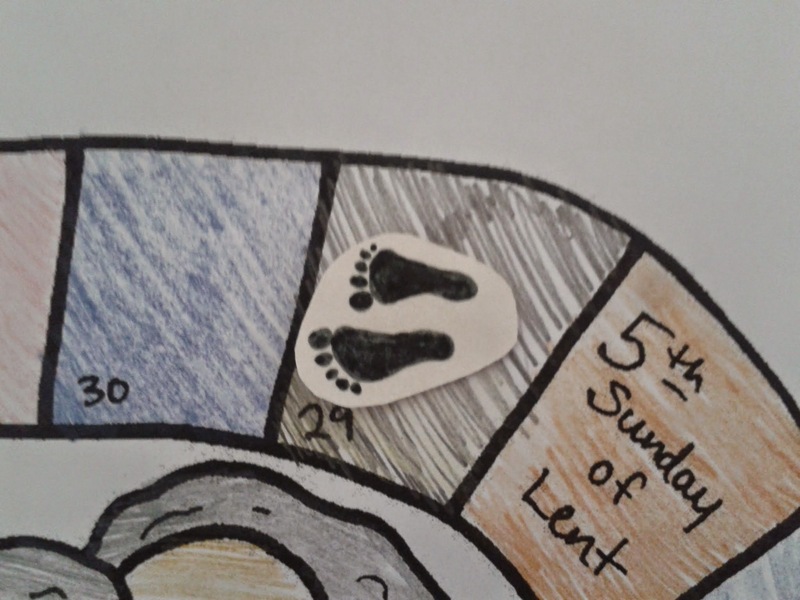 Well, Michelle has a great resource for Lent, based on a Mennonite tradition which I’ve adapted for tinies. I’ve called it the Lent Love Project. All you need to do (from one tired, overwhelmed parent to another!) is print out the 6 sheets, put them in 6 envelopes and open one each Wednesday, starting on Ash Wednesday. You then have the whole week to complete the challenge and they’re not hard at all and can be built into things you may be doing anyway. I think this is going to be totally doable for us as a family. Suggested ages 3-13, depending on your children. Click here for the download. Then I’ll still have the energy to focus on all the craziness which is Easter in our home! So, are you in? Let me know how you find it using these sheets.